Have you ever thought about being able to grow and eat your own nutritious fruit and veggies? They would be grown naturally and be free from herbicides and pesticides. A chook house gives you the pleasure of keeping chickens as well as fresh eggs every morning. If you don't think you have the time or know how, we can help you. Once you have eaten your own fresh and tasty fruit and vegetables home grown in your backyard you will wonder why you have not been growing your own before now. You don't need a large amount of room to build a raised no dig organic vegetable garden. We prefer to use Cypress or Ironbark timbers, both of which are long lasting, naturally termite resistant and contain no chemical nasties, or a corrugated earth Tank. We can help you with that or alternatively we can custom design a raised bed system for you. Let us do all the heavy and dirty work and you can enjoy the benefits of picking and eating your own home grown produce. How about going that one step further towards self sufficiency and keep some chooks which will provide you with fresh eggs throughout the year. You can’t get any fresher than going out to the hen house of a morning and getting a couple of eggs for your breakfast. Chooks also make great pets; they are terrific with children and are very easy to look after. We have chooks for sale throughout the year and in addition to supplying you with the chickens, we can build you a chook house. 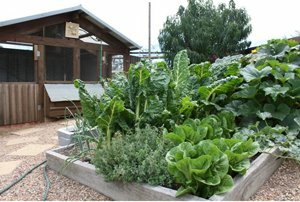 How Can Yummy Gardens Help You? In addition to this we are happy to provide advice at any time. As we are based North East of Melbourne we predominately service the Northern and Eastern suburbs and attached semi rural areas. We are passionate about helping others experience the benefits of organic fruit and vegetable growing and poultry keeping in their own backyard. There's nothing that beats going out to your backyard to dig up a few potatoes for dinner or picking some greens for a salad from your own plot. It is as simple as that.